One really useful garden structure is a bamboo gazebo if your garden is big enough and you want to use your outdoor space for socialising or just somewhere to sit in the shade. A hand-crafted gazebo will definitely have an impact on your garden landscape and can even add to it by creating a bit of a magical atmosphere with lighting and a bar. They come in many different designs and can include features such as a parquet ceiling, hand rails, enclosures, and shades to add privacy to the side panels. A good quality and well designed piece of garden furniture, somtimes known as a 'tiki hut', should be easy to assemble but really strong. The variety of sizes and shapes means you can choose to fit the size of area you have available with hexagonal, square, and rectangle shapes. For example, a semi-enclosed hexagonal shape is excellent for outdoor entertainment, outdoor cooking, just a place to rest in the garden, hot tub, or for a tiki bar. They are also excellent structures to enclose a spa, hot tub, or whirlpool in your garden with the option of adding blinds for extra privacy if required. When purchasing this type of garden furniture or structure, make sure it will withstand the outdoor conditions and maintain its structural integrity over the years. Most will have been processed or coated with a treatment to ensure it maintains its beauty even though subjected to the outdoor elements such as sun, wind, and rain. These gazebos are extremely durable but do ask if it has been treated for things such as termite infestation and such like... depending on where you live. The photos on the left show an example of a unique, one of a kind, 'Tiki Hut', Laguna Bamboo Gazebo that was hand crafted in the Philippines. You can see from the images that it is really well made with a natural finish. 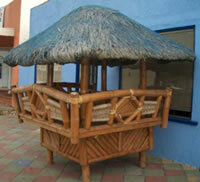 It is 10ft to the top of the roof which is made of palm leaf (the palm is supported by a net). There is a bench inside that seats 6 people so it is excellent for entertaining in the garden, or even just sitting outside under cover of sun or rain with a coffee and a good book. The dimensions are 7ft x 7ft, with a bamboo door on one side, and it includes lighting and electricity switch and outlet. The images above are an example of a unique structure that was for sale on eBay at a really low price considering it had only been used for display purposes.